So, there's not that much to talk about regarding Super Bowl XLIX, am I right? Other than that wild halftime show, the game itself was pretty mundane. It's not like they'll be talking about this game for years to come. Obviously I am being facetious. I think this Super Bowl will go down as the greatest Super Bowl ever. At the very least, it had the most stunning, shocking and ridiculous conclusion of any of them. Where to begin with this wild game? Expectations were high for these two excellent teams this evening in Glendale, hence why it was the smallest spread since Super Bowl XVI with the Patriots being favored by one. And the game certainly delivered. And how about the emergence of Chris Matthews (no, not that Chris Matthews) for the Seahawks. We're talking about a guy that never had caught an NFL pass before this game, who was not even on the Seattle roster two months ago before getting signed off the practice squad in December who a year ago was working at Foot Locker and as a security guard. Fast forward to Super Bowl Sunday when he four catches for 109 yards and a touchdown and was a legitimate candidate to be Super Bowl MVP had the Seahawks won. We had five lead changes and several momentum swings, as well as some missed opportunities. The Patriots struck first on the scoreboard but the Seahawks were able to answer for every first half touchdown scored by New England. Seattle then scored 17 unanswered points to hold a ten-point lead going into the final quarter. The Patriots, behind a stellar performance behind Super Bowl MVP Tom Brady, were able to tie the record for the greatest comeback ever in a Super Bowl to score two unanswered touchdowns to take the lead with two minutes remaining. Check out different angles here and here. It is nice to see that the Seahawks took a page out of the 1997 Nebraska playbook. I'd like you to find me a Super Bowl ending quite like that. Not even The Tackle compares to that. While Russell Wilson does not deserve to get off scot-free for his decision there even as Ricardo Lockette did have some initial separation, and neither should Lockette get off for making a poor play for the ball, plus Malcolm Butler deserves a ton of credit for making an amazing play to get the pick, but that has to be the worst call of all time, specifically in Super Bowl history. Lynch had success running the ball all night and he only happens to be the best player on the offense. How the hell do you not have him take the ball when you need a yard to win the Super Bowl? All in all, a truly stunning finish to a tremendous football game, the likes of which we will probably never see again. 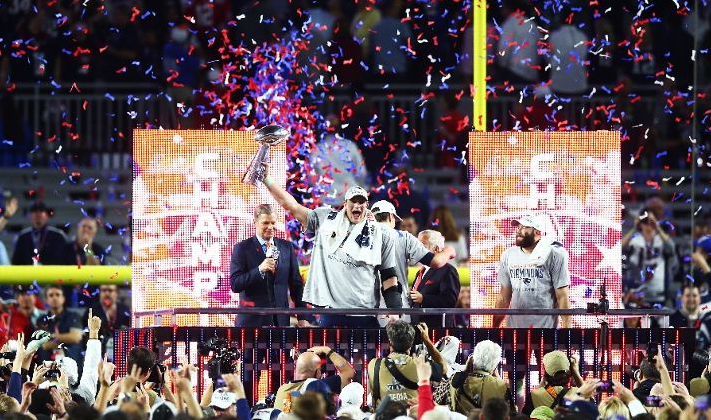 The Patriots are champions of the NFL for the first time in a decade and just like their first three titles, it came in a classic. Only this one was even better. Agreed. It probably was the best one ever. It is just a pity that Seattle lost it rather than New England winning it. The worst coaching call in NFL history denied the Seahawks a repeat win. The positive might be that the Hawks will be hungrier than ever next season but this will hurt for quite a while.